While the ongoing renovations at Place du Canada may be causing headaches for some, they are good news for McGill, as they mean the University will once again have the privilege of hosting the Royal Canadian Legion Québec Command’s official Montreal Remembrance Day ceremony on lower campus. With students and staff in the background, dignitaries and war veterans take part in last year's Remembrance Day ceremony on lower campus. / Photo: Owen Egan. The Nov. 11 ceremony will begin at 10:30 a.m., at which point the band, sentinels and troops will take their positions. Always a crowd favourite, the Pipes and Drums of the Black Watch (Royal Highland Regiment) of Canada will again be on hand. The event will bring together veterans, representatives of Canada’s Armed Forces and special guests, including the guest of honour Quebec’s Lieutenant Governor Pierre Duchesne. The ceremony will include a 21-gun salute from four cannons positioned in front of the Arts Building, as well as performances by military bands. 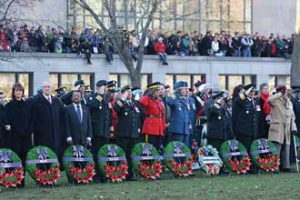 Also, a number of groups, including the federal and provincial government, the City of Montreal, the Black Watch, HMCS Donnacona, the RCMP, and McGill, will lay wreaths at the foot of the cenotaph. Two minutes of silence will be observed at 11 a.m., between the first and second gun salutes. In the 20th Century’s two world wars, McGill lost more than 600 men and women: 363 from McGill perished in the First World War and another 298 lost their lives in the Second. McGill also made significant contributions to the medical care of wounded soldiers in both wars. Since then, members of the McGill community have helped to resolve conflicts in Kosovo, Eritrea, Afghanistan and elsewhere.